It’s been a busy few months for SBID, even for a team whose feet barely touch the ground most of the year! The winners of the SBID Awards have been announced and what a line-up it is. This year’s winners represent, as ever, mind-blowing design across a broad spectrum of sectors. While it can’t be denied that the victorious projects are a feast for the eyes, we know that excellent design must also be effective and enhance lives. Therefore, it’s really satisfying to know that, thanks to the stringent judging process, every one of these examples of breathtaking creativity is built on a foundation of technical knowledge and experience. You can discover the Awards winners on page 6 and read more at www.sbidawards.com. While creativity is essential for success, of course, we know that for designers to make it in the industry they must also possess business skills and be able to network, forge professional connections and stay one step ahead. Our annual 20:20 Meet the Buyer Event is just one of the ways we support our members to thrive, by bringing designers and manufacturers together for a day of networking and industry insight. This year’s event, during our Awards Week, drew a wide range of industry movers and shakers, who came together to make valuable connections. 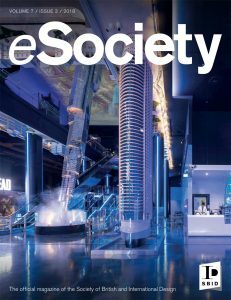 Like every issue of eSociety, this edition embodies everything we believe in, from highlighting world-class creativity to supporting SBID members and the next generation of designers. The finalists of our Designed for Business competition, run in partnership with BE OPEN Foundation, have been announced. With an ultimate prize of £30,000 for the winner, this is a life-changing opportunity; turn to the News pages to find out more.